This beautifully manicured park spread over 55 hectares was opened to public in the 1970s. It was designed in 1792 by the Italian engineer Domenico Bagutt and is Barcelona’s oldest garden. It is a lush and beautiful landscaped space and displays fine example of artistic gardening. There are several hidden nooks worth exploring and several structures and sculptures in the park that’ll amaze you on your visit. It is a charming and a romantic place to visit for a leisurely walk. The highlight of the park is the maze, created from pollarded cypress trees which are also the reason behind the park’s name. Be here for an early morning walk or an evening stroll, you’ll be delighted. Only 750 people allowed entry at a time. Children under 5 yrs and pensioners free admission. 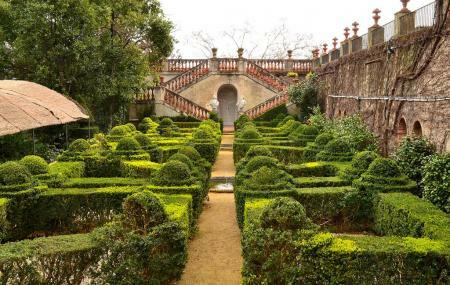 How popular is Parc Del Laberint D'horta? People normally club together Port Of Barcelona and Casa Lleo Morera while planning their visit to Parc Del Laberint D'horta. This place is great. The entrance price is really cheap and it's very entretaining (it's also free every Wednesday and Sunday!). The labyrinth is so much fun; it's hard enough to be a challenge but easy enough to be fun! There are many beautiful structures and there is so much history to this place. It's the perfect place for walking and talking and having a relaxing afternoon, as it often is not too crowded. We went there in the midst of July, when Barcelona is the busiest, and there still was only a handful of people. The location is quite far away from the centre of the city and it is also quite a walk from the subway stop, so I'd recommend grabbing the bus. It is well worth the walk, though. However, for this reason I'd say it's better to go when you have a lot of time, since it's far away and the labyrinth is better enjoyed with time and at a relaxed pace. I love the mythological inspiration this place has; it's a neoclassical build dating from the 1800's. I'd say it's better for older children, since younger children might get tired of walking and might need to use a stroller (which might be bothersome, since there isn't a massive amount of space in the corridors of the labyrinth). Important: on Sunday and Wednesday the maze is free of charge. Located 5 minutes walking from Muntad metro station (green line) the maze is part of a big park with many spots. The maze is pretty small so don't expect for a long experience. This place is super magical with its labyrinth and beautiful gardens ! You can totally take the family here and have a day at the park ! Or a picnic and look around ! You won’t regret it it’s beautiful! 100% recommended! A must see if your visiting Barcelona !